The crisis under which the world is struggling nowadays has led to a rethinking not only of the economic growth model followed by most governments but also touching the roots of western social values. Citizens are claiming globally to have a more prominent role in the decision processes happening in their closest governments along with more openness and transparency in the decisions made by their politicians. This movement is widely known as Open Government. At the same time, budget cuts (among other reasons) are forcing cities to rethink the way public services are delivered and the concept of smartness in public services is appearing strongly in the agenda of city managers now pushed not only to do more with less but also to innovatively change the sustainability models and responsibility roles under which public services are offered. The new concept of smart cities tries to group all these initiatives. The objective of this chapter is to reflect upon the links of open government and smart cities and the need of including the first for the success of the second. To accomplish the aforementioned, this chapter has been structured in five sections. First section provides an introduction of the relation between the concepts of smart cities and open government; concepts that are more accurately described and detailed in second and third section. 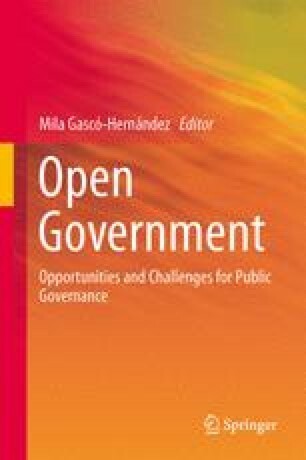 Fourth section explains why smart cities need open governments and provides several success cases to strengthen the thesis of this chapter. The last section contains the conclusions reached by the authors. “A developed country is not a place where the poor have cars, it is where the rich use public transportation”. Gustavo Petro, Mayor of Bogotá. Cottica, A. (2012). Cosa vuol dire “smart” in smart city?. Che futuro!. http://www.chefuturo.it/2012/10/cosa-vuol-dire-smart-in-smart-city. Accessed 31 March 2013. Cohen, B. (2012). “What exactly is a Smart City?”. Fast Company. http://www.fastcoexist.com/1680538/what-exactly-is-a-smart-city. Accessed 30 April 2013. Garriga, M. (2012). ¿Se está fomentando el Gobierno Abierto desde las instituciones europeas? In R-A. Hofmann & P. Bojórquez (Eds. ), La Promesa del Gobierno Abierto. http://www.lapromesadelgobiernoabierto.info. Accessed 30 April 2013. Giffinger, R., Fertner, C., Kramar, H., Kasalek, R., Pichler-Milanovic, N., & Meijers, E. (2007). “Smart cities: Ranking of European medium-sized cities” Vienna Centre of Regional Science. http://www.smart-cities.eu. Accessed 30 April 2013. Howard, A. (2013). What is the return on investment (ROI) of Open Government? http://e-pluribusunum.com/2013/07/19/what-is-the-return-on-investment-roi-of-open-government. Accessed 25 July 2013. Jiménez, C. E. (2013). De ‘Open Government’ a ‘Smart Governance’. Una perspectiva estratégica desde el Back Office. http://www.slideshare.net/estratic/ieee-open-government-and-smart-cities-jimenez-urv2013. Accessed 20 June 2013. Mitchell, W. J., & Casalegno, F. (Eds.). (2008). Connected sustainable cities. http://connectedsustainablecities.org. Accessed 30 April 2013. Open Goverment Standards web site. (2013). Draft of Open Government Standards/Principles. http://www.opengovstandards.org/?page_id=60. Accessed 1 May 2013. Ortiz, I. (2008). Open Government: El concepto. http://eadminblog.net/2008/06/24/open-government-el-concepto/#more-1473. Accessed 30 April 2013. Ramírez-Alujas, A., & Villoria, M. (2012). Innovaciones de raíz democrática en la Administración: ¿Recuperando legitimidad ante la crisis? Ekonomiaz, 80. http://www1.euskadi.net/ekonomiaz/taula4_c.apl?REG=1211. Accessed 1 May 2013. United Nations. (2004). World Population to 2300. http://www.un.org/esa/population/publications/longrange2/WorldPop2300final.pdf. Accessed 1 April 2013. World Economic Forum, WEM. (2011). The Future of Government. http://www.weforum.org/reports/future-government. Accessed 1 May 2013.